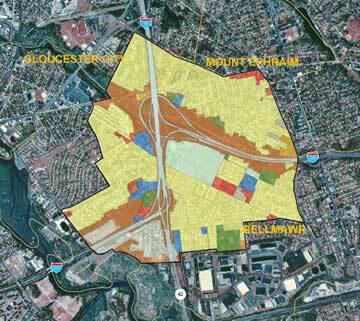 The study area consists of residential, industrial, commercial, recreational, and public/quasi-public land uses. Residential land uses comprise most of the study area within Bellmawr. Low density residences, which include detached single-family residences, two-family residences, and row houses comprise 329 acres, or 47 percent, of development in the study area within the borough. Public and quasi-public constitute the second largest land use category within the study area in Bellmawr. Nearly the entire area within Mt. Ephraim that is included in the study area is residentially developed and primarily consists of detached single-family dwellings. This land use constitutes 174 acres, or 74 percent, of the study area within the borough. The only commercial development within the study area is a six-acre strip of neighborhood sales and services located along Kings Highway. The entire portion of Gloucester City that lies within the study area consists of single-family residential uses and vacant land. Residential land use constitutes an area of 50 acres, or 72 percent of the study area in Gloucester. There is no new development proposed in the portion of Gloucester City that is located within the study area.